Preheat the broiler. Line two baking sheets with foil. Cut the bacon slices in half and place on one of the lined baking sheet. Broil for 3 minutes. Remove the bacon from the oven and allow to cool. 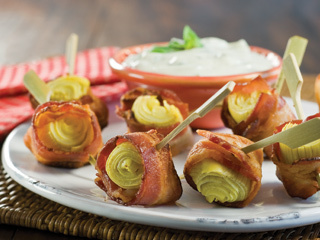 When cool enough to handle, wrap each artichoke half in a piece of bacon with the broiled side touching the artichoke. Place wrapped artichokes on the second lined baking sheet and broil for 4 minutes. For game day, appetizers can be reheated on the grill until bacon is brown and crisp.